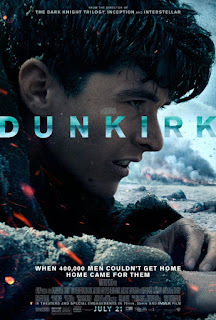 Normally I would scoff at a pretentious statement like, “it's less of a film and more of an experience," but I'm not sure there's a better way of describing Christopher Nolan's war epic, Dunkirk. It doesn't have characters so much as it follows a few people around during a dark time in human history. In fact, I can scarcely recall a single character’s name and specific characteristics are few and far between. I'll likely have to refer to each character by the actor’s name in order to explain what happened in this movie. Nevertheless, Nolan’s strength as a filmmaker is his ability to combine parallel lines of action effectively, and here he does so as well as he ever has. Eventually it becomes clear that those titles are indicative of when each line of action began, and that Christopher Nolan is doing a bit of his trademark nonlinear editing. Much like he’s done many times throughout his filmography, Nolan shows us a scene only to return to it later with new context. Here we tend to see things at least two or three times but as the three lines of action begin to converge our understanding of those scenes changes. It’s a perfect example of the power of editing. Nolan shows us the same events multiple times, but our reaction is slightly different each time. By the time Nolan has finally brought all his principal players together he has molded a powerful narrative of survival and heroes willing to put their lives on the line for others. Dunkirk is a bleak film, but that allows for some genuinely beautiful moments of humanity in otherwise dire situations. Death and destruction is all around these people. It can come for anyone at any moment. It’s such a common occurrence that when German bombers make their brief attack run, killing British soldiers like fish in a barrel, by the time they leave, everyone goes back to their business of awaiting the next boat home with nary a shred of emotional reaction to the men who have just died. Everyone needs to board a ship in order to go home, but being aboard a ship is the least safe place they can be. One of the film’s best moments is when a large collection of civilian ships finally arrive to ferry the men to safety. Hans Zimmer’s beautiful score swells and the men cheer to see people from back home having come to rescue them when the British Navy was unable to do so. We’ve seen plenty of films about war heroes serving their country honorably, and likely paying the ultimate sacrifice for it, but rare is the film that concentrates so intently on civilians showing their love and appreciation for their soldiers that they’re willing to put themselves in grave danger in order to save as many of them as they can. Don’t get me wrong this film has its share of heroes. Tom Hardy plays a pilot who spends all his fuel in order to stay in the air as long as possible to defend the men on the beach and the boats in the harbor. He doesn’t say much and his face is covered by a mask for most of the film but he leaves a lasting impression anyway for his heroism. The film has also been touted as a remarkable achievement in filmmaking for its use of 70mm IMAX format. The larger the screen you see this film on the more immersive the experience. That’s thanks in large part to Hoyte Van Hoytema’s beautiful cinematography. He places his unusually large camera in tight spaces to give us a similar sense of claustrophobia the people experiencing these events must have felt. But he also gives us wide sweeping shots that give us a bird’s eye view of the mostly practical effects used throughout the film. All of this gives Dunkirk the impressive scale of a classic war epic. Adding to the experience is Hans Zimmer’s excellent score that sounds like a blending of his tense, action-oriented work on Nolan’s Batman films and his more moody, minimalistic work on Interstellar, it adds another layer to the artistry here and elevates every scene. Many are calling Dunkirk the year’s best film. Some are even calling for Christopher Nolan to receive his first Oscar nomination for Best Director. Generally speaking the Academy have snubbed Nolan and his work more often than not, so it would be truly significant to see him finally get a nomination. And he deserves one for Dunkirk. It’s a great film. It gives hope to all the Nolan fans who wondered if he might have been trending downward after The Dark Knight Rises and Interstellar, two films that received mixed critical reception. Dunkirk is an ambitious film made on an epic scale, and it’s one of Nolan’s best films.